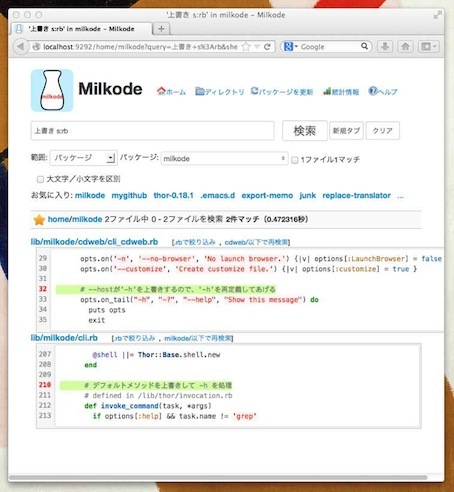 Milkode is source code search engine of "line-oriented" written by Ruby.It have command line interface and web application. It will accelerate the code reading of your life. It is possible from the file tens of thousands of the order, to search instantly a line that contains the keyword of interest. Milkode is "見るコード". "See a code" is meaning. When you faild to install Rroonga, Please refer. Create database to current dir. If you want to use custom database, Please specify MILKODE_DEFAULT_DIR variable. Add source code from local directory. result     : 1 packages, 42810 records, 42810 add. 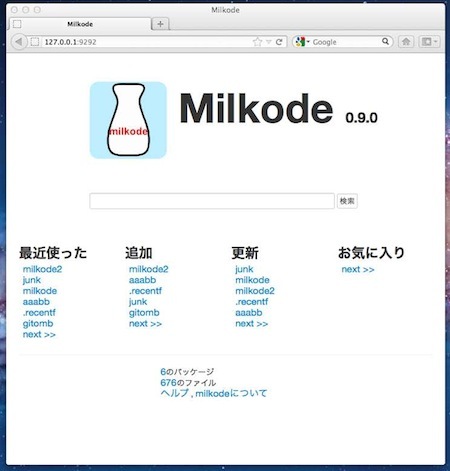 *milkode*  : 1 packages, 42810 records in /Users/ongaeshi/.milkode/db/milkode.db. Add source code from gem. Add source code from GitHub. Add source code from http-zip. Gmilk command can use the AND search. Gomilk is faster version written by Go. Generated on Sun Apr 21 14:35:06 2019 by yard 0.9.19 (ruby-2.5.1).